I was invited last year to present a seminar on the relations between heritage and landscape at the second workshop of the EU-funded ‘Sustainable Futures for Europe's Heritage in Cultural Landscapes’ project (HERCULES) held in Amsterdam in September 2014. As a member of the Project’s Advisory Board, I was asked to provide some inputs on how cultural landscapes in Europe are made and re-made from a ‘critical heritage theory’ perspective, offering an outside and (hopefully) provocative assessment of the Project work. These thoughts on how landscapes come to be ‘nationalised’ through self-referential heritage narratives, and become ‘time-tagged’ in the process of their valuation and categorization fit in to these wider comments. Tarr Steps is talked about as a ‘famous landmark’ and a ‘tourist attraction’ – there is not much space to its use as a “bridge” as such! The BBC excerpt starts off by talking about the use of “21st Century technology” to repair “one of our oldest and most unusual ancient monuments”. Who do they mean by ‘us’? – the ‘nation’? … as though the original builders conscious of British (or English) nationalism? And what does an ‘ancient monument’ monumentalise, exactly? (‘ancientness’?). Tarr Steps is variously described on public websites as being ‘ancient’; ‘prehistoric’; ‘Bronze Age’; ‘around 1000 years old’; ‘perhaps built in around AD1400′; or – probably the safest suggestion, given the range of alternatives – of ‘unknown age’. Such heritage items as bridges and trackways are notoriously difficult to ‘date’. But of course the entire BBC news item is about how it is actually being (re)built in 2013. One could argue that it is the newest bridge in the country!? But I guess they are not really building a ‘bridge’ – they are building an ‘ancient monument’: one of the region’s most famous landmarks and tourist attractions. I did a little bit of asking around (I have a postgrad, Tim Wilkinson, working on perceptions of Exmoor): Tarr Steps has also been ‘built’ in 1942 (by the army, as some sort of training exercise – I guess they needed to practise such skills since they knew they’d have to cross the Rhine following the allied invasion of Europe! – a joke!). It was also built in 1952, following the well-known floods that caused havoc (and killed several people) in Lynmouth. It was also rebuilt in 1979, and again in 2008. During this last building stage, each stone was numbered and electronically tagged so that they could be replaced in ‘exactly the same place’ if they were ever dislodged: I guess the repair crew working there this week are thankful for this. 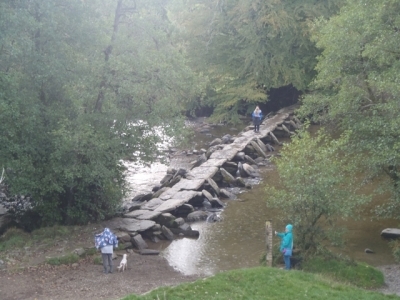 Tarr Steps is not just ‘new’, it is also one of the most technologically advanced bridges in the world. At the same time, Tarr Steps has been ‘petrified’ through conservation – to act as a totem, or icon of a certain set of ideas. In Exmoor National Park literature, on websites and in guidebooks, Tarr Steps is usually portrayed as a mysterious space that is (usually) emptied of people. It is one of Britain’s Breathing Spaces: romantic, simple, tranquil and self-evidently ‘national’. Re-reading the news reports, however, it seems that (as far as I can make out) the repair bill was picked up by Somerset County Council’s Road Budget. After all, Tarr Steps is a Public Right of Way. Perhaps what is being ‘preserved’, therefore, is the notion of public access and common rights to free movement. This concept is also difficult to ‘date’ in any standard format, and is surely a flexible and dynamic phenomenon, which would seem to open up a metaphorical and literal ‘pathway’ to the countless ordinary people who have used the bridge to cross the River Barle for “a long time”. Drawing on the work of Patrick Wright, there seems to be many examples where national landscape-heritage is something that is ‘already achieved’ – it has a supposedly timeless historical identity, which demands only appropriate reverence and protection in the present. I would certainly not call for the demolition of Tarr Steps, but perhaps a bit more openness and honesty as to its present-centred and on-going role in the multi-faceted life of Exmoor would be a good thing. Tarr Steps is not a static entity – while some form of ‘Tarr Steps’ has been in place for many centuries, one could argue that the present edifice is fairly new, while its on-going role in society, as a place to enjoy a picnic, go for a walk, meet family and friends (as well as to cross the river without getting one’s feet wet) is something to be celebrated. Rather than something that is ‘already achieved’, we need space for seeing Tarr Steps as the emergent product of a heterogeneous society that makes its own history as it moves forward. Tarr Steps is a stone-built structure that has been re-built many times because it is ‘useful’. It has recently been used as a ‘heritage icon’, postcard subject and honey-pot tourist site and perhaps its most enduring purpose has simply been to get across a big river without getting your feet wet. It's interesting that the tags have been used. If the bridge's heritage includes its various processes of reconstruction is the tagging somehow taking away the human agency if this heritage act value? Physical human reconstruction of the bridge may still occur, but does the transfer to binary data of deciding how the bridge is remade remove the humanness of future reconstructions relative to earlier ones or simply modernise the method of recreation? appreciation by present and futures societies. No doubt however modern archaeologists have studied its design and attempted to understand its construction methodology thoroughly and this has been documented for guidance of future heritage professionals as well as for the greater appreciation of local and national communities. Thanks for this comment: Interesting to think that there might (perhaps) have been 70 or more versions of 'Tarr Steps' and, as you suggest, each stone (and more) has probably been incorporated in several different ways over the years. The nod towards engineering is also a really clear steer towards the celebration of 'intangibles'; of the heritage of skill, craft and labour - as well as a strong prompt for 'experimental' forms of archaeological practice. As inspiring as the talk you gave at the HERCULES meeting, thank you very much. I hope we HERCULES will be able to use this new door you have opened for us in the landscape as heritage approach to create an innovative discourse.